I’m so thrilled with these! 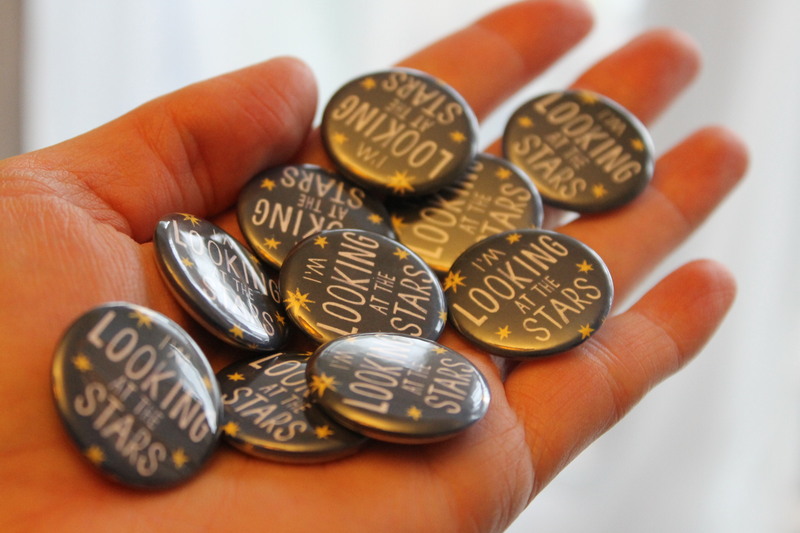 They’re button badges which say I’M LOOKING AT THE STARS and I ordered them from the lovely people at www.buttonbadges.co.uk – aren’t they BRILLIANT?! I sent them a design (done by the fantastic Dom at Random House – thank you!) and they made the badges from it. I shall be taking them on my school visits to promote the book and also to the launch party I’m planning in February 🙂 Big thanks to George and the others at Button Badges – these are even better than I imagined! hi earlier today i asked if i could send you my dystopian story to see if you liked it. i have only done the begining so far but anyway here it is. The dead black night. Faint wind blowing through her beautiful hazel hair, with a nauseating streak of blonde in it. With her pale skin and her green eyes elegantly featuring her face. Taja used to be small, useless and a bookworm. But since then she has learnt how to evolve for the better. She is now agile fast and petite so there is now almost nothing she can’t do from the knowledge she had learnt. The government wants to exterminate people like Taja they think they are dangerous, just because they’re different. Taja was sitting at the window looking at the gut-wrenching devastation that was before her eyes. She could remember when the streets were filled with love laughter and happiness. The children playing in the streets, and all the mums chatting happily. Taja had a family a mum, dad and brother. Her mum was called Julien her dad was called Philipine and her little brother who was called Niago whom was only two years younger than herself, they were all very close, and every Saturday they would go out on a family trip to somewhere fun. All of Taja’s family really like the trips since they had so much fun together on them. She had never been as upset and felt as alone as when she was sat there thinking about her family and friends. She blinked, moved her head. She knew she wasn’t alone she could smell them, they were coming for her. The scent was getting stronger. Her mind was yelling at her RUN TAJA RUN! It was too late, A terrifying thought struck Taja, she had nowhere to go she was cornered…Where are they? Taja couldn’t see them. Sweaty palmed and heavy headed she knew she had to fight or run. Taja ran but it followed her. She ran for her life through the ruins of her home. The tattered furnisher the scruffy chairs the broken pictures of her family that held so many happy memories that no longer exist. Torn curtains and carpets with thick grimy layers of mud ash and sadness even the window was shattered and broken. All of her life ruined by the war. The war between the worlds. The war happened 5 years ago in 2072 when the Cririms attacked Earth. The Cririms look almost exactly like humans the only thing that is different is that they have no ear lobes. And they can hear people’s thoughts. After the war the Cririms won over the government and they now hold all humans as slaves and the ones who resist them are tracked down and captured. No one knows what happens to them next because the government takes them to park 390. Only aliens come out of there alive. Taja could hear her heart thumping like a herd of gazelles running through a deserted desert, and she could taste blood in her mouth from running rapidly. Taja remembered the one place they couldn’t find her; the Edge. The only question left is will she make it?